Range is book four in the Junco series. Once again I am blown away by the writing. I feel like I’ve been on a roller coaster when I read a Junco story. Junco has become one of my favorite heroes. She is a hurt, angry, vulnerable, brave, smart, crazy, generous, loving woman. And she just wants the pain to stop. She is tired of being lied to, abused, taken advantage of and taken for granted. She has HAD enough! 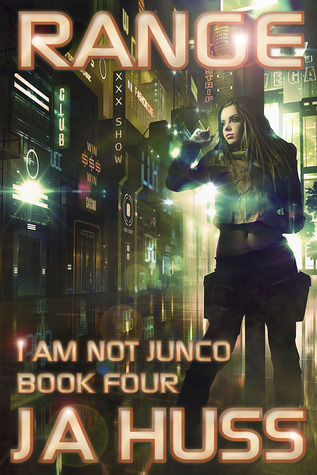 Read the Junco series if you are a fan of science fiction or just a fan of strong world building and a main protagonist that won’t let you forget her, intriguing secondary characters, danger, romance, death, destruction, snark and perseverance. Do you know how excited I am about these books in J.A. Huss’ I Am Just Junco series? I have been waiting almost 6 months! 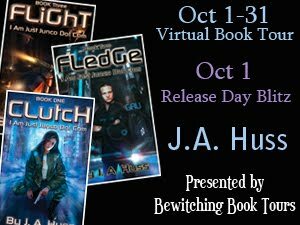 Review of Clutch by J.A. Huss + EPIC Contest! I love to read science fiction fantasy and urban fantasy so when I read the synopsis for this series I was intrigued. I’m so thankful I followed up on my impulse. I LOVED the first book!!! My review is below. I am rather kicking myself for not signing up for the rest of the tour. :p But I enjoyed Clutch so much I have already bought the sequels. The author, J.A. Huss is running a great contest all month. The Rafflecopter is at the bottom of the post. Make sure you enter for a chance to win 1 of 2 $50 gift cards and 3 autographed copies of Clutch. She is also giving everyone who signs up for her newsletter this first story, Clutch, free! I know *shakes head* an abundance of riches. She rocks! Ok, here’s my review…. Clutch is a fast paced, addicting, science fiction adventure that hooked me from the start. When I first read about the book and saw that the heroine was 19 years old I assumed it was a YA novel. Ummm… It’s NOT! Junco is a damaged, tough, messed up cookie and she has a mouth on her like a sailor. She swears all the time. :p There’s also violence and adult situations (not as much as I’d hoped for :p but the beginnings of a romance). Junco’s tough, she takes a lickin’ and keeps on tickin’. I liked Junco, actually I adored Junco! This is a first person novel… That’s not my favorite perspective normally, but for this story I was immediately sucked into Junco’s head and her world and held on tight for the ride. This is an adventure story, a vengeance story and a mystery and even the sparks of a love story… Its a story with science, politics, war, lies, intrigue and destiny. The world building felt so organic and real. The pieces of her life are stacked up naturally and never felt like “So Bob,” kind of details. 🙂 Everything seemed to flow and because her world is not so unfamiliar from ours I was able to easily suspend disbelief and enjoy this tale of humans in a possible future, aliens with wings, gene splicing and cloning and a host of other fascinating details.